The Braila case study site is located in the north-eastern section of the Romanian Plain (Figure 11). It has an agricultural area of 387,646 ha (of which 350,001 ha are arable land), and has specific geomorphologic, hydrological and climatic conditions, which necessitate the use of an ameliorative agricultural system. Within Braila County, there are distinguishing physiographic relief units: Calmatui Plain, part of the Braila Plain (51% from County area) and the Floodplains of Danube (Big Island of Braila), Siret, Buzau and Calmatui rivers (49% from County area). Braila Plain is characterized by a specific micro-relief with large floodplains, poorly fragmented, with altitudes ranging between 20-25 m in the east, and 35-40 m to the west. Floodplains, areas adjacent to the Danube, Siret, Buzau and Calmatui rivers are located at lower altitudes, ranging between 2-4 m and 13-15 m and are characterized by the presence of alluvial soils formed on river-limnic and alluvial deposits, with alternating of layers with different textures. Figure 11. 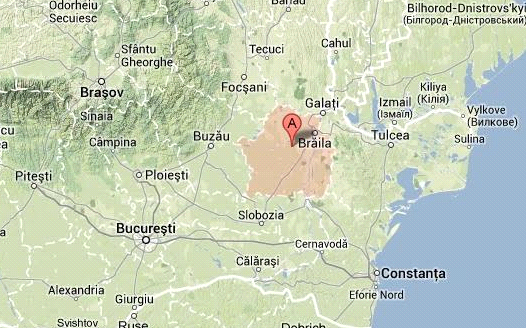 Study site location of Braila County in Romania. In 2001, within Braila County was declared a Ramsar site, the Small Island of Braila Natural Reserve (with an area of 17,586 ha; 44°58’ N, 27°55’ E), a group of wetlands in the Lower Danube region. This is one of the rare areas along the river that has preserved its natural hydrological conditions and which contains a representative sample of habitats characteristic of floodplains. The site is of major interest for at least 34 internationally protected bird species and 65 species of fish. Two of the bird species, Phalacrocorax pygmeus (pygmy cormorants) and Pelecanus crispus, are considered priorities for LIFE financing. The wetlands perform important hydrological functions, particularly during seasonal floods, and affect the local microclimate. The adjacent “Big Island of Braila”, five times larger in size, was largely drained during the previous political era. Regional management plans in the past have tended to favour intensive agriculture, but more recently, sustainability has emerged as a key objective. Currently, the Big Island of Braila is delimited by two of the Danube river arms (e.g. Valciu and Macin arms) and is managed by a private company, namely SC AGRICOST SRL, making it the largest agricultural farm in Europe (56,135 ha). According to the United Nations Convention to Combat Desertification, Braila County is located in an arid region with an average annual temperature of 10.9°C, long-term average annual precipitations (P) of 447 mm, potential evapotranspiration (ETP) of 705 mm (750-800 mm in dry years) and an average climatic water deficit of 258 mm (350-400 mm in dry years). The biophysical aridity index (P/ETP = 0.50-0.65) places the case study site in an area with a moderate risk to desertification. Both intensive and extensive farming systems are practiced within Braila County (Figure 12). Intensive agriculture, characterized by high inputs and yield levels, is evident on large arable farms. On the other hand, extensive agriculture, with low input and yield levels, is practiced by farmers on small arable farms, and is so-called the semi-subsistent agriculture. Also, within the case study site, mixed farms that have both vegetal and dairy sectors, are recorded. The livestock from the 20 dairy farms include: 156,000 pigs; 1,200 cattle; 6,000 sheep; and 1,000,000 hens and broilers. Figure 12. 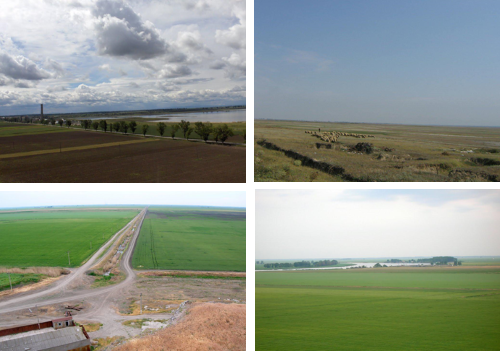 Variety of land uses and landscapes in the Braila County area. The main soil types in the Braila Plain area are: chernozems (164,367 ha – 43% from County area), cambic chernozems (21,999 ha – 6% from County area) and soils formed on loess deposits. On the other hand, in the floodplains of the Danube and the other rivers, alluvial soils (129,020 ha), gleysols (19,980 ha) and mollic gleysols (10,488 ha) represent around 41% of County area. On smaller areas, sandy soils (19,830 ha – 5% from County area) and solonchaks (20,183 ha – 5% from County area) are spread within the Calmatui Plain and in river floodplains, respectively. Agricultural land quality reflects both soil fertility and behavior of environmental factors, which influence plant growth. Applying a soil quality classification taking into account these factors and consisting of five classes, around 47% of the agricultural area of Braila County belong to 1st and 2nd quality classes, meaning that these soils have high fertility, and around 34%, 12% and 7% of the agricultural area belong to 3rd, 4th and 5th quality classes, respectively. Within the case study site, the Agricultural Research and Development Station of Braila (ARDS Braila) operates, which is subordinate to the Academy of Agricultural and Forestry Sciences. The station ARDS Braila conducts research and development in the following areas: irrigation systems, agricultural technologies and improvement and reclamation of salted soils. Currently, the station ARDS Braila has two research projects funded by the Ministry of Agriculture and Rural Development dealing with: efficient exploitation of natural water resources in irrigation systems to reduce water consumption in irrigation and soil fertility conservation; and, improving rice cultivation technology in ameliorative rice growing sites placed on salted soils undergoing soil reclamation. Since 1977, Romania has developed the “Agricultural Soil Quality Monitoring System”, an improved soil surveillance system for soil quality of agricultural and forestry soils, which was coordinated by ICPA. The physical and chemical parameters were observed in georeferenced sites on a fixed grid of 16 x 16 km; in total 670 agricultural monitoring sites being located, analyzed and characterized at the national level. As for the case study site, 17 sites were analyzed and characterized. As a result of this ‘monitoring system’, maps with the current quality/state of soils were produced by using a set of physical, hydro-physical and chemical indicators (e.g. soil texture class, available water capacity, humus content etc.). Also changes in soil quality due to degradation processes, such as soil compaction, erosion, heavy metals pollution were identified.